If you are looking for famous hotels in San Francisco, look no further! The Fairmont San Francisco is the best famous hotel, full of charm, character, and luxury. Before the days of Instagram and travel blogs, I had the best San Francisco resource a gal could ask for - my grandfather. When I moved to the city nine years ago he had already been in Hawai’i for almost 50 years, but that thankfully didn’t mean he had forgotten all about the city by the bay. He would tell me about watching the 49ers play in Golden Gate Park, recommend that I check out The Marina for the best sunset views, and ask me to visit Fillmore Street so I could let him know what it was like these days. And, of all the hotels in San Francisco there was one he loved above the rest, and that was The Fairmont. 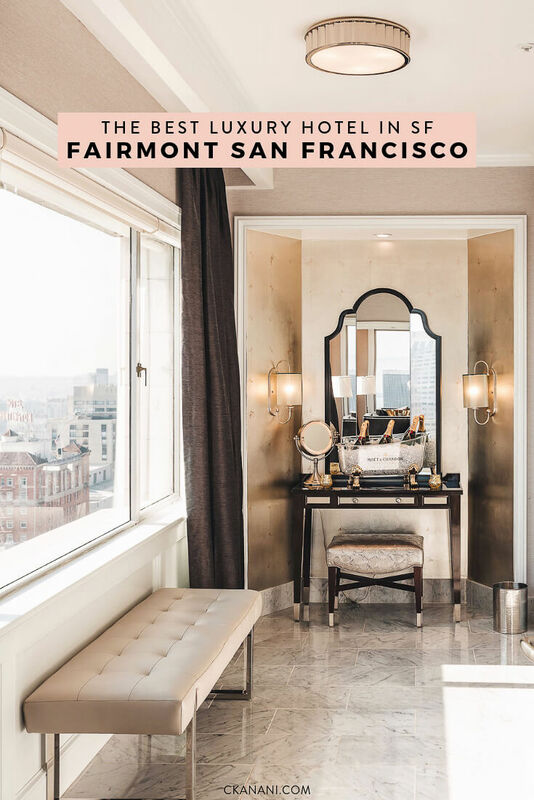 I had visited The Fairmont San Francisco many times over the years, both because it is a popular San Francisco spot for locals and visitors and because of my grandpa’s recommendation. For a special Valentine’s Day dinner at the Tonga Room, to see the brilliant holiday decorations, for a handful of parties, but never overnight. So when The Fairmont recently invited me to pay them a visit, I jumped immediately at the chance to walk the same halls my favorite ancestor did and see what all the fuss was really about. So what was the fuss about? When it comes to famous hotels in San Francisco, the Fairmont gets my vote for many reasons. 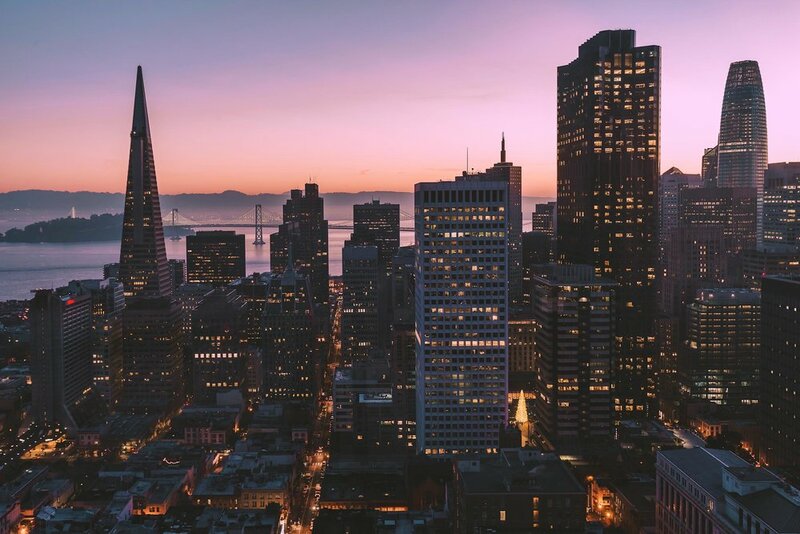 It has the perfect location, the best views I have ever seen in SF (and I basically hunt views for a living), the most glamorous rooms and suites, and delicious food and drink in their three restaurants and bars. It's officially my favorite hotel in SF now, too! The Fairmont San Francisco is a world-famous, five star luxury hotel located in the city’s Nob Hill neighborhood. Originally scheduled to open in 1906, it was delayed until 1907 after the 1906 earthquake and fire caused damage. 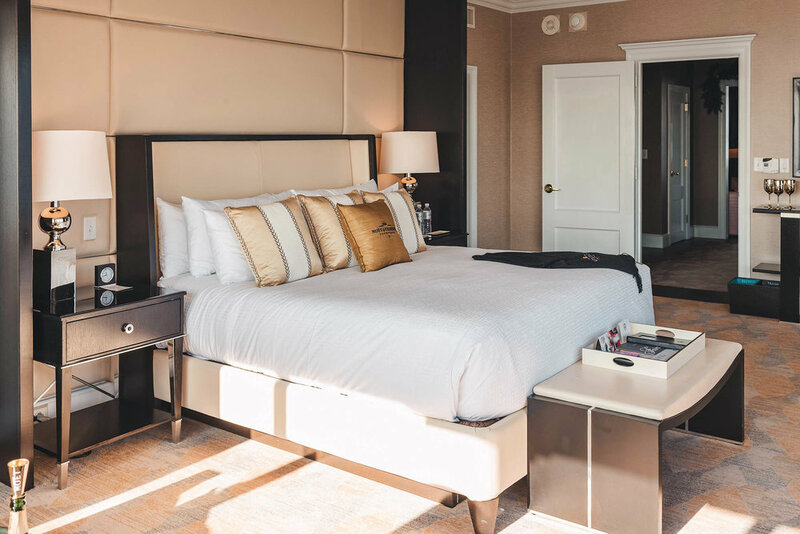 The historic hotel is fully-restored and is a true San Francisco staple. It features over 600 rooms and suites and three different restaurants and lounges. Side note: if you love history like I do, the hotel's history is an interesting read. 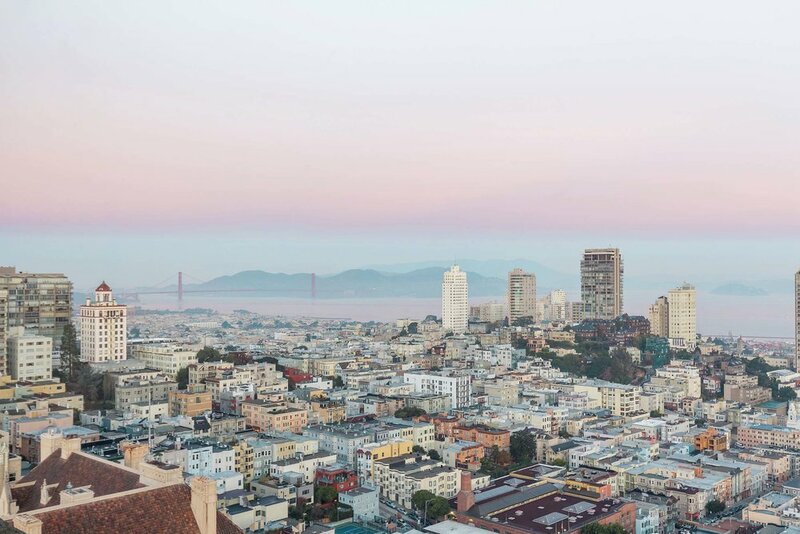 The Fairmont San Francisco is centrally located on top of Nob Hill, offering beautiful panoramic city views. 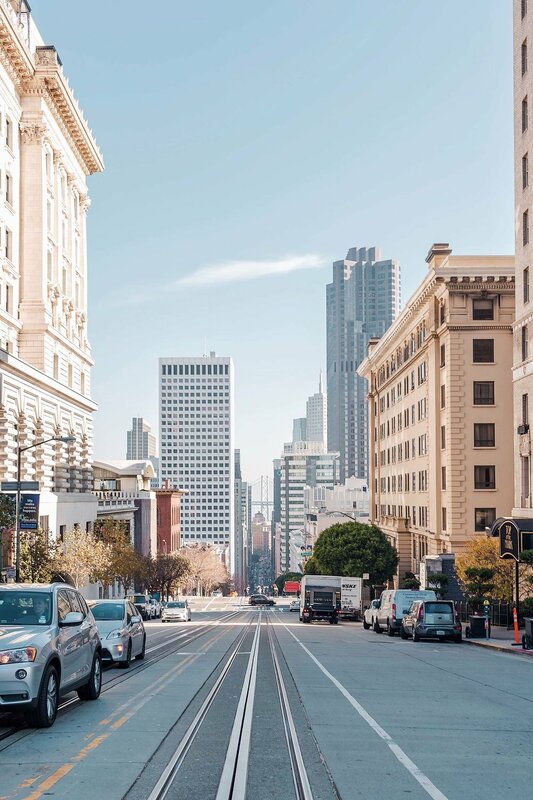 It’s the only spot in SF where all of the cable car lines meet, making it easy to hop on the city’s most iconic transportation mode to get to downtown, Union Square, and Fisherman’s Wharf (if you dare brave the crowds!). Not far in the opposite direction are two of my favorite neighborhoods - The Marina and Pacific Heights. 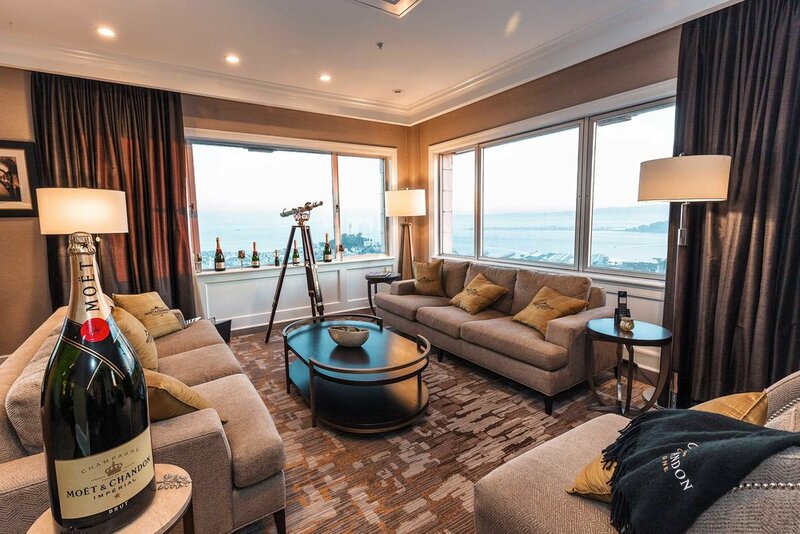 Fairmont San Francisco has 606 rooms, including 62 suites, 10 of which are balcony suites. 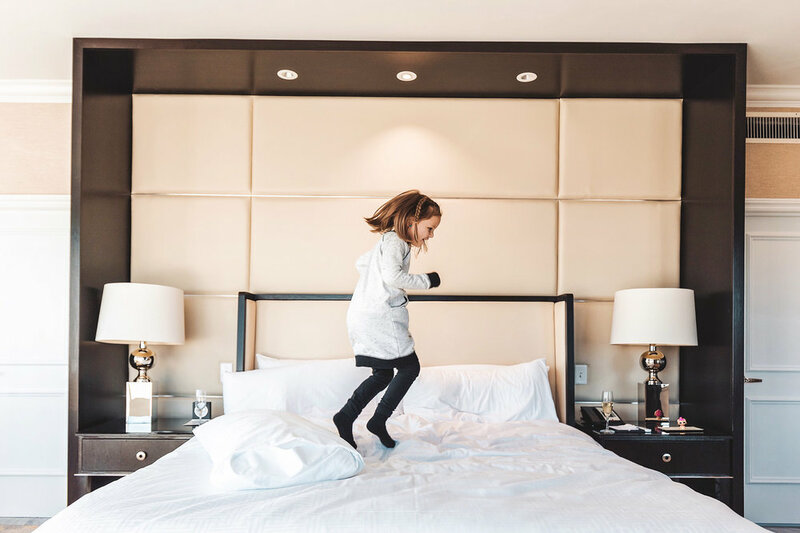 They have guest rooms to fit every need, 7 different suite categories to choose from, and a handful of astonishing one-of-a-kind suites. They're a mix of modern and classic and each beautifully decorated (translation: Instagram-ready). Click here to explore the different options. 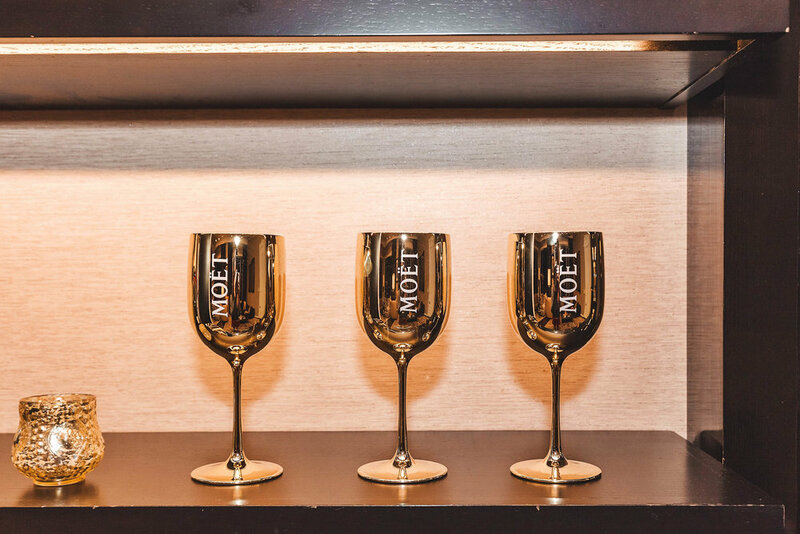 I was lucky enough to stay in the Fairmont Presidential Suite while it was magically transformed into a Moët & Chandon-inspired Sparkle Suite. The suite was by far the most amazing hotel room I have ever even set foot in. It’s located on the 23rd floor and offers jaw-dropping 270-degree views of the city. You can see everything: the Golden Gate Bridge, Alcatraz, Coit Tower, Bay Bridge, Transamerica Pyramid, Sutro Tower, Twin Peaks, and more! 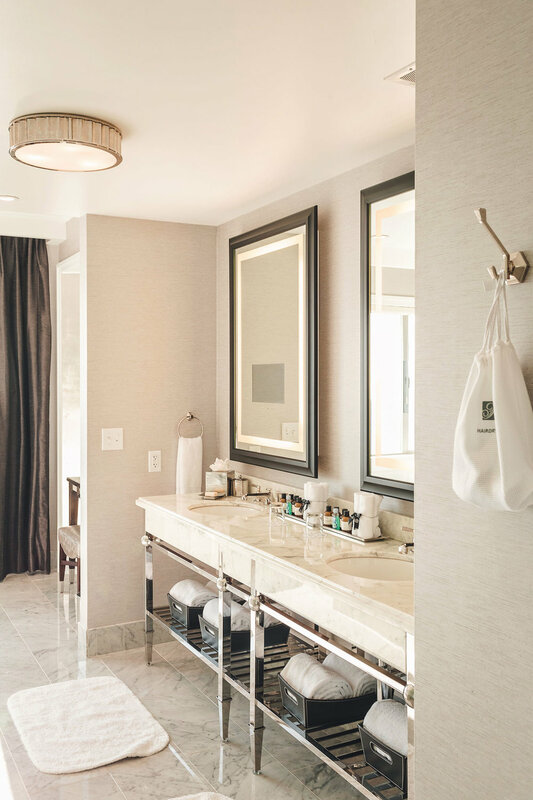 The spa bathroom is beyond glamorous and includes a double vanity, marble shower and an infinity bathtub with the best view I've ever seen from a bathtub (or possibly ever). The living room fits up to 20 people, making it the perfect spot to celebrate something (anything) special. I honestly cannot recommend it more. 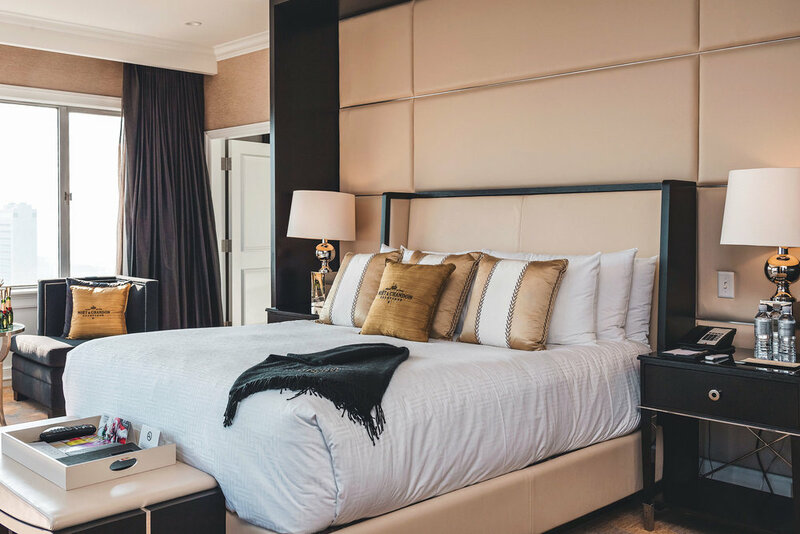 Click here for more information on the Fairmont Presidential Suite. LAUREL COURT RESTAURANT & BAR - showcases seasonal, local, innovative California Coastal-inspired food. It is open for breakfast, lunch, and dinner, and is also where the hotel’s afternoon tea takes place. 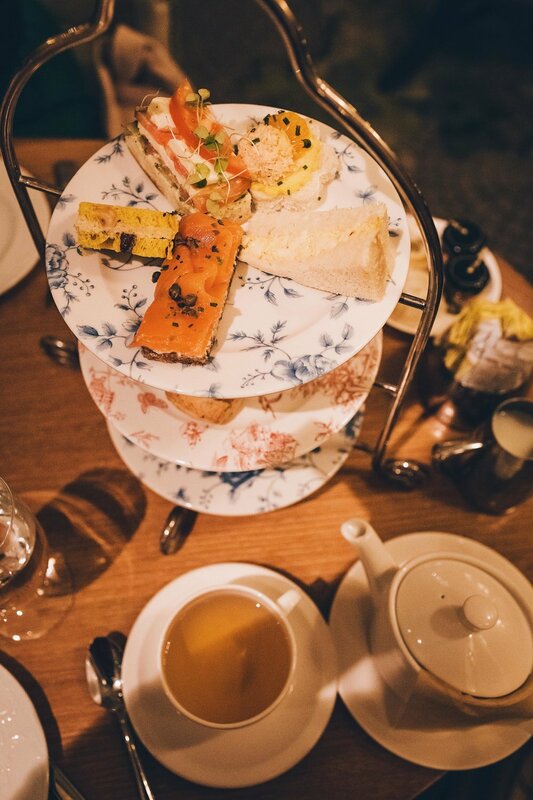 Afternoon tea is absolutely delicious, featuring incredibly delicious house-made sandwiches, scones, pastries, and sweets.Find hours, menus, and make reservations here. TONGA ROOM & HURRICANE BAR - a world-famous, tiki themed restaurant and bar! It’s been open since 1945 and, fun fact, my grandpa once rented it out for his mother’s birthday. Home to the city’s best mai thai and often called "San Francisco's Best Happy Hour", it also offers Polynesian food in an extremely fun tropical setting! What’s so fun about it? There’s a pool in the middle where a live band sometimes plays, and you might even witness a thunder and lightning storm or two. Don’t miss it - even the locals love it :) Find hours, menus, and make reservations here. CAFFE CENTO - a cute coffee shop featuring Illy coffee and Ghirardelli chocolate. Take it to go and enjoy it on the rooftop garden! More details on Caffe Cento here. Fairmont San Francisco also offers in-room dining 24 hours a day. Try the french onion soup! It was the best I have ever had. Menu and more info available here. Fairmont San Francisco is also a popular spot for meetings and events, as well as weddings. Find options and more info here. And whatever you do, don’t miss the rooftop garden! It offers magnificent views of downtown and has comfy outdoor seating to lounge on in the sunshine underneath the palm trees. Click here to see the latest prices and book your stay! This project was done in partnership with The Fairmont and Travel Mindset. All of the above is, as always, my own opinion.